An unaltered photocopy of your DD-214, OR other military issued document clearly displaying your EFMB award. I. DESCRIPTION: An oxidized silver badge 15/16 inch in height and 1 7/16 inches in width consisting of a stretcher crossed by a caduceus surmounted at top by a Greek cross. II. SYMBOLISM: The Medical Corps insignia of branch, modified by the addition of a Greek cross suggesting the Geneva Convention between the wings and the entwined serpents, signifies the recipients skills and expertise. It is superimposed upon a stretcher alluding to medical field service. III. AWARD ELIGIBILITY: This badge recognizes Army medical personnel for attaining a high state of technical skill in field medical functions. 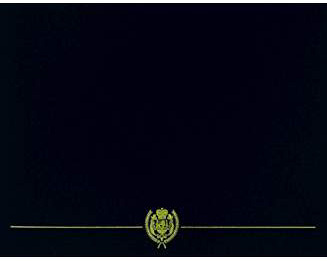 It is awarded on the basis of proven skill and performance. Prior to being awarded the badge, personnel must successfully pass all test parts prescribed by Army Regulations. IV. 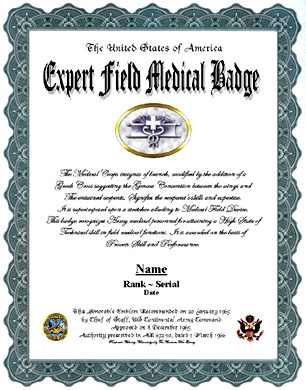 DATE APPROVED: The Expert Medical Badge was approved on 18 June 1965. V. SUBDUED BADGES: Subdued badges are authorized in metal and cloth. The metal badge is black. The cloth badge has an olive green base cloth with the stretcher, caduceus and cross efmbroidered in black. VI. MINIATURE BADGES: A dress miniature badge 9/16-inch in height is authorized.